"A land where nature left the book open..."
The Galapagos, made up of 13 large islands, six smaller islands and over 40 islets, are located in the Pacific Ocean 600 miles west of the Ecuadorian mainland. Its wonders span from the most varied geological formations of lava flows, blow holes, spatter cones and lava tunnels, and beaches of olive, white, or black sand, to the most diverse landscapes and species of animal and plant life. On some islands you will find red mangroves, scalesia trees and acacias, while on others you will see cactus, micronias and Palo Santo trees.The most surprising sight for visitors, however, are the animals, which astounded Charles Darwin on his visit in 1835. The giant land turtles gave the archipelago its name and are just some of the species unique to the islands, as are the Galapagos Penguins, Darwin Finch, hawk and marine iguana. You will also see Blue-footed Boobies, swallow-tailed gulls, bright yellow warblers, fur seals, sea lions, frigate birds and free-roaming albatross. Point Suarez: Sea lions, curious mockingbirds. From April to November waved albatross courtship rituals. Colonies of Blue-footed Boobies and masked boobies. Stunning swallow-tailed gulls, red-billed tropicbirds, Darwin Finches, Galapagos Doves and Galapagos Hawks. Sally Lightfoot crabs and the famous "Blow Hole"
Located on the equator, the Galapagos Islands have a surprisingly cool, sub-tropical climate. The larger islands with volcanic peaks have a variety of climatic zones. The coastal areas are arid and covered with plants adapted to desert conditions. The highland areas receive moisture almost all year round, which support lush vegetation. Temperatures are determined almost entirely by ocean currents, which are influenced by the trade winds. There are two seasons, both of which have some precipitation. The Galapagos get an average of ten inches of rain per year, so it is never considered "rainy". Unlike most equatorial regions, the Galapagos are not hot and humid; they lie instead in one of the Pacific's "dry zones" where temperatures remain abnormally low, cooled by upwelling in the sea. The Galapagos cycle through two distinct seasons: the warm/wet season (January to June) and the cool/dry season (July to December). From June to November, the cold Humboldt Current sweeps northward from the Antarctica. When it reaches the northern tip of Peru, the southeast trade winds push it toward the Galapagos. This mass of cold water cools the air and creates an inversion layer over the islands. The inversion upsets the usual weather pattern associated with the tropics. While the lowlands are experiencing drought, the highlands receive misty precipitation locally known as "garua" (pronounced gah-ru-ah), which means mist in Spanish. The months of October And November are transition months, between the hot season (December-May) and the dry season (June-November). In general days will be alternately sunny and partly cloudy. Days do not begin with full sunshine, but are rather cloudy until about 10:00 AM; and as the day warms up the clouds dissipate and the equatorial sun shines. Clouds return at about 5:00 PM. This is the general forecast, but guests should not be surprised if one day the sun shines brightly between 6:00 AM and 6:00 PM. It is still windy (the Trade Winds from the southeast), and early morning and late afternoon activities may feel chilly, so we recommend a light jacket, parka type (windbreaker). The wind is cool, particularly at the end of the day, since the temperature of the water does not exceed 72°F-74°F. Visits to the highlands of Santa Cruz Island may include some very fine drizzle and mud; lightweight pants and the suggested jacket will come in very handy. During the months of December to May, the cooling currents subside, temperatures rise and the southeast trade winds and the Humboldt Current vanish. Warm waters flow south from Panama. Periods of rain are strong but are of short duration. Temperatures are warm and sunny days outnumber cloudy days. Some years, the flow of warm water is greater than normal and a phenomenon known as "El Nino" results. Surface water temperatures climb higher than usual and rainfall greatly increases. Life on land flourishes, but seabirds and marine life frequently experience extreme breeding failures. · In some years March temperatures reaches beyond 86°F. · The rainy season reaches the highest precipitation (this does not mean it rains everyday). · Sporadic tropical rains, intense sun and hot climate. Air temperature can reach up to 86°F. Humidity is high. 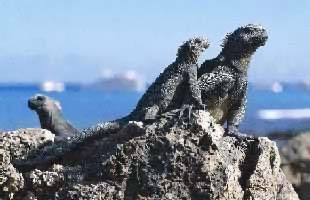 · Marine iguanas nest on Fernandina (Narorough Island). · March 21st, the beginning of the summer equinox signals the arrival of the waved albatross to Española (Hood) Island. 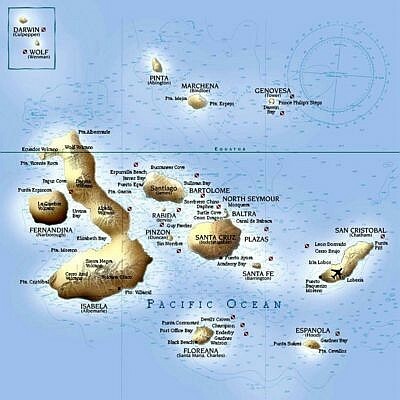 · Even the western islands have warm waters where snorkeling is excellent. Punta Vicente Roca (Isabela Island) can be an amazing site. Penguins are still active in the water, next to tropical fish - a bizarre sight! · Some shores, especially those facing the north side, can receive deep surge (ola de fondo) coming from the northern currents. Wet landings at places like Puerto Egas (Santiago or James Island), Gardner Bay (Hood Island), and Bartolome Island can sometimes be a challenge. · Snorkelers can remain in the water for longer periods. · Massive arrival of waved albatrosses to Española (Hood) Island. Amazing courtship starts. · You may just see the beginnings of the garúa season, when a fine mist can appear. · South east trade winds return. Currents become a bit stronger. Seas pick up in surge and wave action. · Many red pouches can be seen on the male magnificent frigatebirds at North Seymour as they search for a mate. · Southern migrants have started their journey towards the north. Galapagos is a rest stop for such birds. Some species of cetaceans (whales, dolphins and porpoises) also follow this pattern of migration. 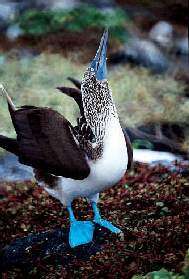 · Sea bird communities are very active (breeding), especially the Blue footed boobies on Española. Flightless cormorants perform beautiful courtship rituals and nesting activities on Fernandina. · If you walk along the shores of Puerto Egas (Santiago Island) you can find American oyster catchers nesting. · Great month to see the four stages of nesting in Blue footed boobies: eggs, chicks and juveniles. · Water temperature does not reach more than 68°F. · Galapagos hawks court on Española (Hood) and Santiago (James) Islands. · Nazca (masked) boobies and Swallow-tailed gulls nest on Genovesa (Tower) Island. · The temperature of the ocean drops to 64°F, which obviously varies according to the geographic zones among the islands. · Migrant shore birds start to arrive, and stay on the islands until March. · Giant tortoises return to the highlands of Santa Cruz. · Oceans are quite choppy, currents at the strongest levels, surge can be expected along the shores that face west or south. · Pupping season (births) of sea lions has started. Western and central islands are common places for such sightings. Peak of the "garúa" season, when the weather is at its coldest and potentially there is fog and sea mist in many locations. The air temperature reaches its lowest levels, 66°F. · Galapagos Penguins show remarkable activity on Bartolome Is. Since May swimmers and snorkelers can be delighted at Bartolome with penguins active at the surface or torpedo-like while underwater. · Sea lions are very active. Females have reached estrus stage, and so harem-gathering males are constantly barking and fighting. Shore fighting is heavy. Western and central islands are the most active ones in terms of sea lions' activities. · Most species of sea birds remain quite active at their nesting sites. · Peak of the "garúa" season, when the weather is at its coldest and potentially there is fog and sea mist in many locations. The air temperature reaches its lowest levels, 66°F. · Galapagos Penguins show remarkable activity on Bartolome. Since May swimmers and snorkelers can be delighted at Bartolome with penguins active at the surface or torpedo-like while underwater. · Blue footed boobies raise their chicks all over Española (Hood), North Seymour and Punta Vicente Roca (Isabela Island). · Days are not always sunny. A drizzle is common at the beginning of the day, but later it stops. · Towards the west of Galapagos dawns are beautiful, due to the type of clouds present during this season, and to the presence of drizzle in certain parts of the volcanoes. Summits are clear, but low clouds cover the coast. · Sea lions are sexually active towards the east of the archipelago. · It's the breeding season for brown-noddy terns. · Some species of jellyfish can be seen. The genus Physalia is common, floating around Gardner and Tortuga Islets, as well as in "flour beach" of Floreana Island. · Band-rumped storm petrels start their second reproduction period. · The sea is calmer and the Trade Winds start to decrease. Water temperatures slowly rise. · In general there is fine weather, given the transition between one season (the dry one) and the next. · Sea lion pups (especially those of Champion Islet, Floreana Island), play aqua aerobics with guests doing snorkeling. Most pups are curious enough to play with the fins of snorkelers. The average age of the pups is three to four months. · The rainy season begins, all of the plants of the dry zone produce leaves. Galapagos becomes "green"